Procambarus lagniappe, the lagniappe crayfish, from Mississippi. Photo by Chris Lukhaup, courtesy of the U.S. Forest Service. In early January, scientists led by the Zoological Society of London (ZSL) published results of a global assessment that shows that almost a third of the world’s species of crayfish are threatened with extinction. U.S. Forest Service aquatic ecologist Susie Adams was a co-author on the report and provided important information about North American crayfish species. Adams was invited to be part of a collaboration with 76 experts from the International Union for Conservation of Nature (IUCN) started in 2010 to review the conservation status of the world’s 590 species of freshwater crayfish. The process led to IUCN Red List assessments of all the species. 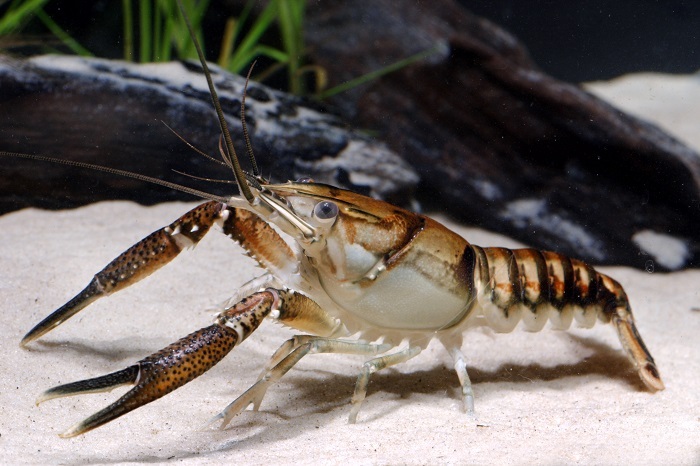 Results published in the Philosophical Transactions of the Royal Society B show that 32 percent of all crayfish species are threatened with extinction, a much higher rate than that of most land and marine species. “Though freshwater ecosystems take up less than one percent of the Earth’s surface, they support some 10 percent of the world’s species,” said Adams, who researches crayfish and other aquatic species for the Forest Service Southern Research Station Center for Bottomland Hardwoods Research in Mississippi. The project initially used information Adams compiled for status reviews of about 63 species. She was then invited to a work session with other astacologists (crayfish researchers) from the U.S. and Mexico to conduct status reviews of all North American species. Adams wrote or contributed to status reviews for 47 species as well as co-authoring the review paper. The assessment found that the most common threats facing U.S. and Mexican species result from pollution, urban development, damming/water management, and logging. Though the extinction rate for U.S. species is less than that of North America as a whole, the report highlights a major hotspot of crayfish diversity in the South, notably Tennessee, Alabama, and Mississippi, where 53 percent of U.S. species (189 of 357) can be found in a single state. The study notes that despite growing evidence for a freshwater biodiversity crisis, freshwater species, particularly invertebrates such as crayfish, are underrepresented on endangered species lists and in management plans for biodiversity. Only one percent of U.S. freshwater crayfish species, for example, are listed under the U.S. Endangered Species Act, compared to 20 percent of mammals. « Older Previous post: A Future for Freeze-Tolerant Eucalyptus in the South?